Elaborate cooking is worthwhile for many recipes but some recipes are so simple yet very healthy and tasty too.This is a very simple chewy kinda cookie with oats and banana that hardly requires any expertise to bake and with less ingredients too.These can perfectly serve as breakfast cookies or a yummy snack to school going kids.Oatmeal is rich in fiber and should be included in our daily diet.I don't like oatmeal porridge and so try different ways to include this in my diet.There is no sugar added or butter in the recipe.Do try & enjoy !! -Process the old fashioned oats coarsely or use quick oats.I used a combination of both quick oats and old fashioned oats so skipped pulsing the oats. -Mash the bananas using a fork until mashed.Add in the vanilla extract. -Pre heat oven to 350 degrees F and then line a tray with parchment paper. 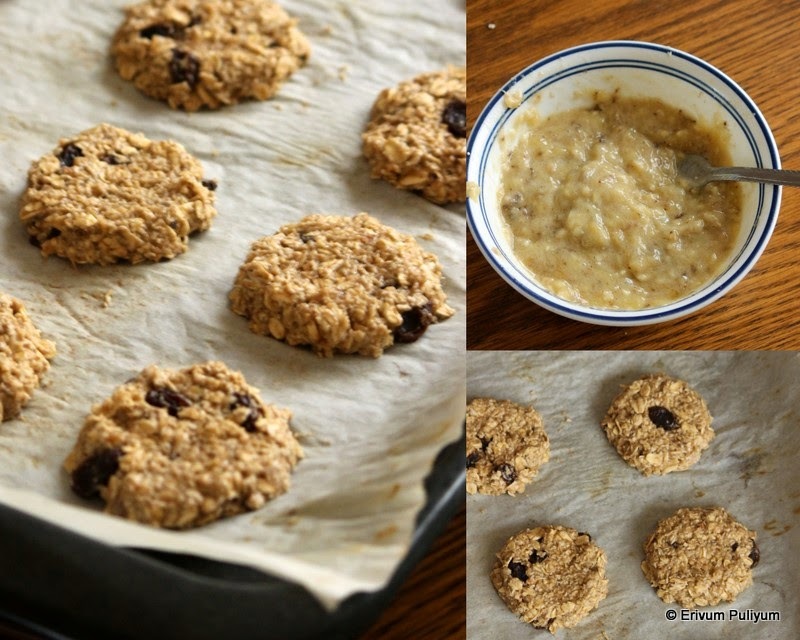 -Mix the oats with mashed bananas.Stir in the raisins or chocolate chips. -Scoop a spoonful into the tray and gently shape the sides and top using the back of a spoon or spatula. -Bake in oven for 12-15 minutes until it starts to leave the parchment paper. - Cool on wire rack and serve for breakfast or as snack !!! * You can add powdered sugar if its lesser than your desired sweet tooth.I haven't added sugar as I like it mildly sweet and the crunch of raisins makes it perfect.But for kids you should add a little sugar to please their sweet tooth. Chilli Chicken, a popular one in restaurants and a frequently ordered one as well.Kids love this a lot and have made it many times.Initial versions were with food color but now without food color,adding food color doesn't change the tastes but definitely the looks for sure.This recipe is one which has never found a chance to be photographed as mostly whenever its made kids will grab the bowl and are off to finish or when guests arrive and I don't get time to take shots.Some or the other reason until now kept me postponing to post this recipe and now finally few days back,I got a chance to prepare this and kids were away too,so by the time they returned photos were captured.I needn't elaborate (explain) the tastes much as it is well versed with most of the non vegetarians.Do give it a try if you are looking for a yummy appetizer.Enjoy !!! Cut the chicken in small bite size cubes,clean & wash the chicken under running water.Drain water in a colander and keep aside.Prepare a thick marinade using corn flour,wheat flour,red chilli powder,turmeric powder,lemon juice & salt.Add water if required.Add the cubed chicken pieces in it,marinate it for half an hour. Heat oil in a pan and fry the chicken pieces in the oil in batches till golden brown on all sides.Drain on a paper towel. To the same remaining oil,add the minced ginger and garlic.Saute till the raw smell disappears.Add the cubed onions,saute for a minute or so,add the cubed bell pepper /capsicum. Add in the red/green chilly sauce and soy sauce. Mix the corn flour with half a cup of water,stir without lumps.Add to the mixture and keep stirring till the sauce thickens. Now,slide in the fried chicken pieces gently so that it doesn't break.Toss in careful with the sauces,cover for a minute or so till the sauce coats well with the chicken pieces and dries lightly.Switch off flame. Garnish with chopped spring onion or cilantro. * I prefer shallow frying the chicken pieces but you can always deep fry too. * You can add 2 drops of red /orange food color to get the restaurant style,but I have omitted. * In case,you wish to add more spiciness then add 2-3 red dry chillies too. * If you wish to have more gravy,then add water & corn starch to the sauce accordingly. * I have used light soya sauce,if you prefer the dark one then add as per taste. Sev is a deep fried snack,noodle like strands made with gram flour and is popular in India for garnishing chats.Though the thinnest mold makes the best sev but in my mold the thinnest is quite thick and so they look almost similar to mixture.Anyways if I get hold of a thin mold sooner,will update pics.Sorry that I couldn't click step by step pics as this was made as a quick snack for kids,will update as and when I make again.Apart from the looks,the taste is just the same as store brought and so kids loved it very much.This hardly requires any preparation time and can be made ready before hand too.Do give this a try and enjoy over your chats or just like that !!! Sift the flour,spice powders,hot cooking oil and salt.Stir well to mix evenly. Add water(1/2 cup )to knead smooth dough.Add another tbsp or 2tbsp of water if required.Adjust salt and add if any required. Scoop out dough using a spoon and place in moulds. Drain on a paper towel and repeat this process of frying till you finish the whole dough. Wait to cool and then crush gently with hands to desired length. 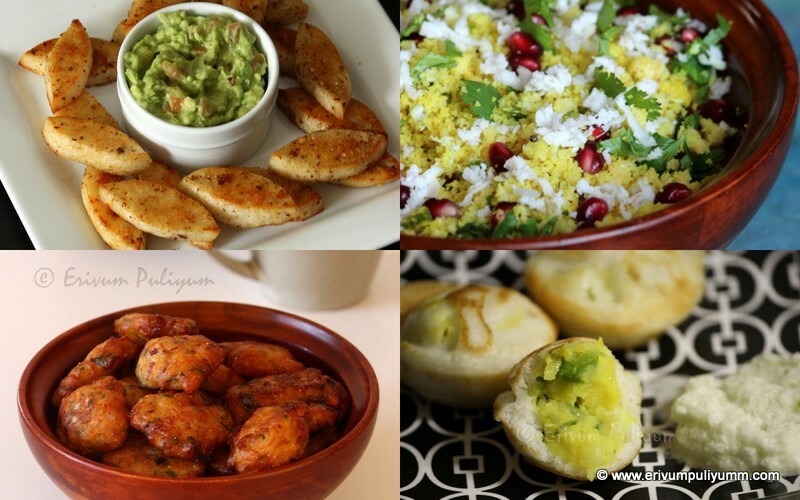 Serve with chai just like that or in bhel puri chat or in golgappa(pani puris) !! * The oil shouldn't be too hot nor under heated as well.Just drop a tiny bit in the oil and watch it fluff up to the surface of oil.This is the correct time to know oil is hot. * If you don't use garlic or don't like the flavor of garlic please leave it out.If you don't find garlic powder,use crushed garlic. Kaya Mezhukuparetti (Raw plantain stir fry) is a healthy stir fry recipe from Kerala.This is served as a side dish with steamed rice.I wasn't a big fan of this stir fry unless I stayed away from home missing this veggie.Now,this is regularly added in our grocery list whenever we get hold of fresh raw plantains.They provide the daily requirement of dietary fiber and provides more potassium and vitamin A than regular bananas.Try out this healthy stir fry with steamed rice and hope you like it !!! Wash and peel/scrape the skin using a knife or you can keep skin too.I usually scrape it gently by pulling out strings so that the very first outer layer is removed.Oil your hands before peeling skin so that it dosen't stain your hands.Cut and soak the thick slices of plantain in a bowl of water or use kanji vellam(cooked rice water). 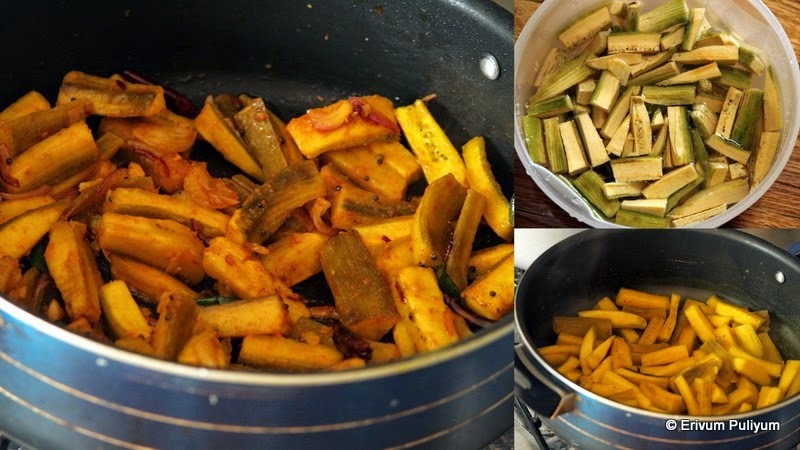 Drain the water and add the pieces ,turmeric powder,salt and 1/4-1/2 cup water just enough to cook the plantains.Cover and cook for 7-8 mins until tender(no over cooking).Drain any left over water,keep aside. Heat a non stick pan,splutter mustard seeds.Add the curry leaves,dry red chillies,shallots sliced,garlic cloves and saute until shallots turn translucent. 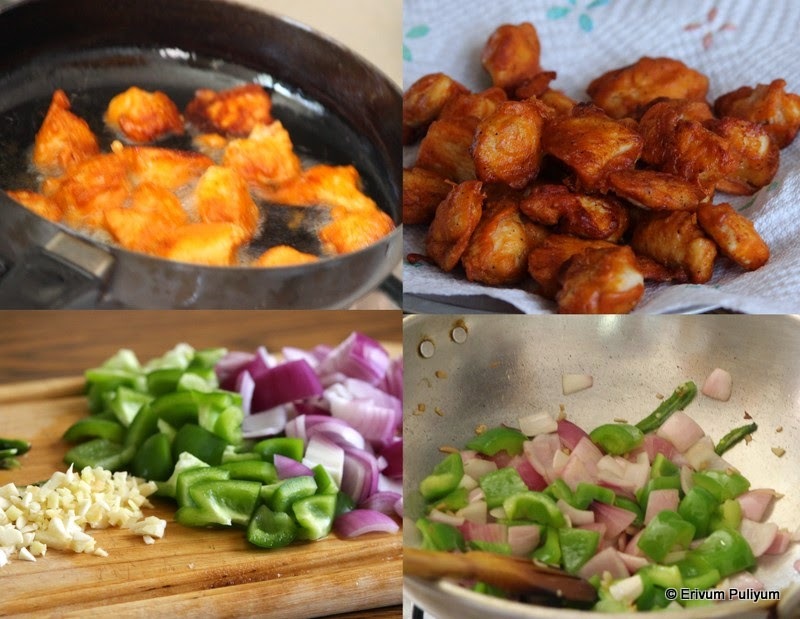 Add the chilli powder on low flame and saute.Add the cooked plantain.Toss well,add salt. If you wish a very dry version,then stir fry until crisp. (takes about 5 mins on medium high heat) and if you wish a slightly mushy version then cover and cook on low flame for 5 mins.Uncover lid and saute till no moisture left. Serve warm with rice !! Blueberries had been always fascinating to my kids ever since they have seen these cute blue beauties.And they like anything baked with blueberries in it.Lemon blueberry bread and these muffins both were equally liked by them and I feel that's the best compliment you can get as a mother baker.Though I adapted the recipe from here but I have modified it as per my family's tastes and healthy part in mind.The batter is slightly thick and not ribbon consistency unlike other muffin batter just to hold the blueberries together in place else they will all sink to the bottom.Hope you try and enjoy as breakfast muffins or as a healthy snack for kids after school !!! 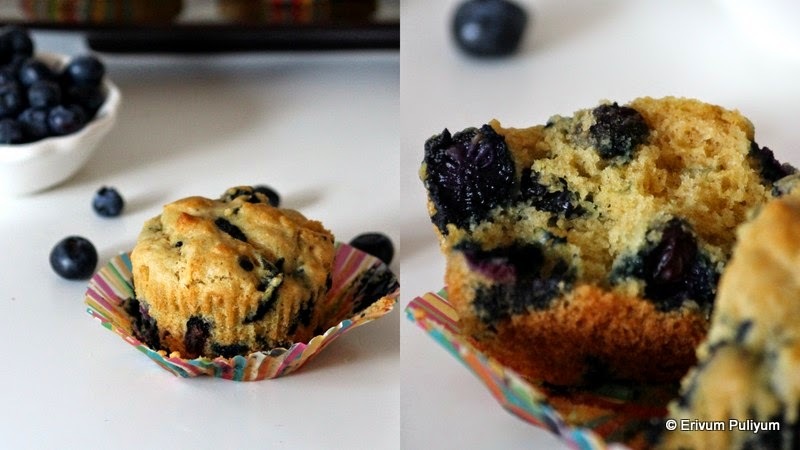 Wash the blueberries under running water.Toss the blueberries in 1tbsp of flour and set aside. Sift the wheat flour,baking powder,baking soda and salt twice or thrice so that the flour is aerated and the baking powder and baking soda gets evenly distributed. Whip the yogurt with granulated sugar until the sugar is dissolved with a wire whisk.Add in the oil and vanilla extract.Keep ready. Add the wet ingredients mix with dry ingredients and incorporate well with a spatula. Pre heat oven to 375 degrees F and line a muffin pan with 12 paper liners. Add in milk slowly(1tbsp each) and keep mixing if the dough turns too thick.I added the whole 1/3 cup milk,you can always add as desired.The batter should be thick but not very very thick and unlike other batter for cake it shouldn't be of ribbon consistency. Toss the blue berries and mix to incorporate but don't let the blueberries get mashed up. 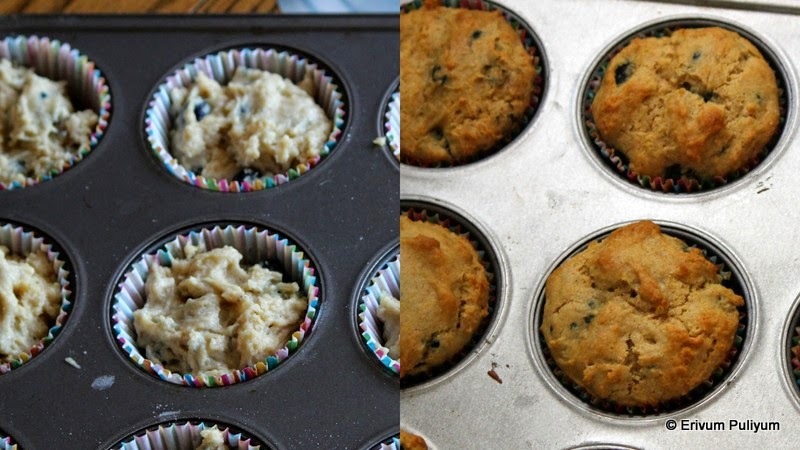 Scoop the batter in each muffin liner upto 3/4 full and repeat until you finish filling all muffins. Bake at 375 degrees F for 15-20 mins or until the tooth pick inserted in the center comes out clean. Cool on wire rack and serve !!! * You can use all purpose flour/maida for the same recipe but reduce the baking powder to 1 1/4 tsp rather than 2tsp. * I have used regular atta flour that we use for making chapathis. * If you wish the butter flavor,replace oil with butter.1/2 cup of oil is 1 stick butter. 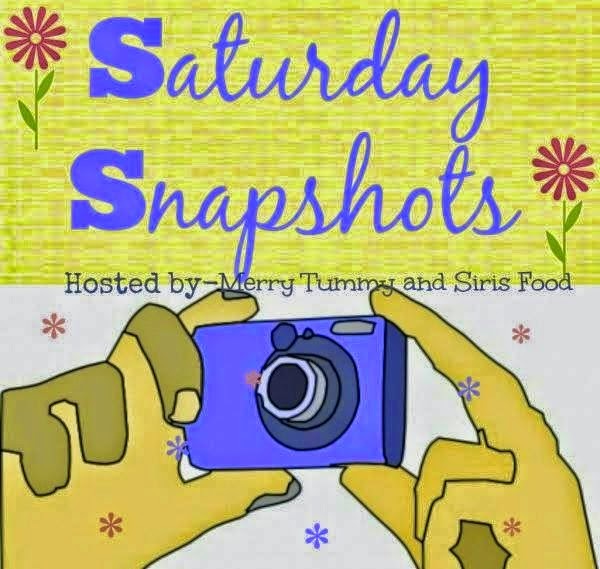 Achari Chana(Chole) | Chick Peas cooked in Pickled Spices (Step by Step Pics) & Saturday Snapshots !! Achari Chana (Chick peas in Pickled spices) is a self explainatory dish.This is a well spiced,tangy curry that can evoke our minds and lip smacking good.This is the first time I tried a dish cooked in pickled spices.I should say kids also loved the blend so well that they fished their dinner early unlike other days.I have posted a simple chole curry recipe earlier but this is quite different from the previous one.Thanx Pari for the recipe.Hope you all like it and try at home.Enjoy !!! Wash and soak the chana or chick peas overnight or 6 hours or 4 hours in hot water.Drain the water and add fresh water.Pressure cook in a cooker with salt for 3-4 whistles on medium flame. Dry roast the spices in a pan and grind them coarsely or smoothly in powder form.Keep aside. Heat oil in a kadai /wok and add the green chillies vertical slit.Saute for a minute or two till its wilted nicely. In the meantime,add in a blender the roughly chopped onion,ginger and garlic.Grind it smooth and add to the kadai.Saute until the raw smell disappears and the oil separates on top. Also,blend the tomatoes and handful of cilantro/coriander leaves until smooth.Keep aside. 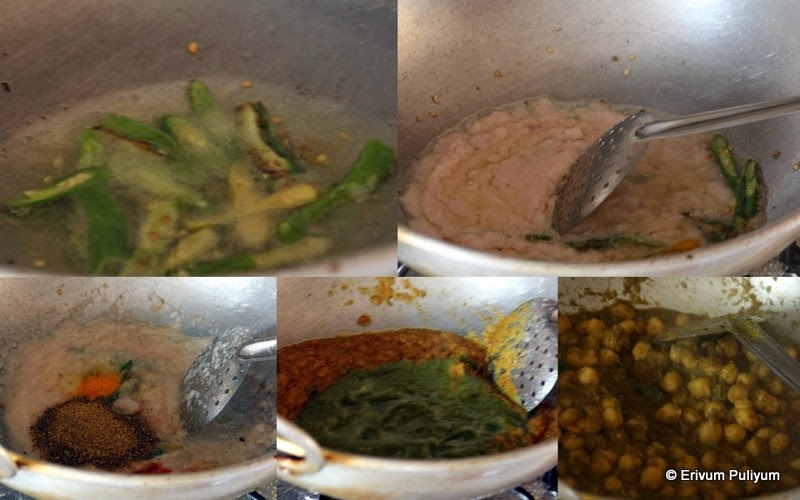 Add the ground pickle spices,turmeric powder,chilli powder (if using) and saute till raw smell of spices disappears. Add the tomato cilantro blend,yogurt(if using) and saute until the oil separates on top and is reduced considerably.Add the amchur powder and add salt. Add the cooked chick peas alone without stock and saute with the mixture. Add the stock about 2 cups and cook for 15 minutes until the chick peas gets coated well with spices.Add salt if required.The cooking time may vary as per your desire to have a thick consistency gravy or thin. * The original recipe calls for 4 tomatoes and I used 3 tomatoes and a tbsp of yogurt.You can use yogurt alone too instead of tomatoes or use half of each. 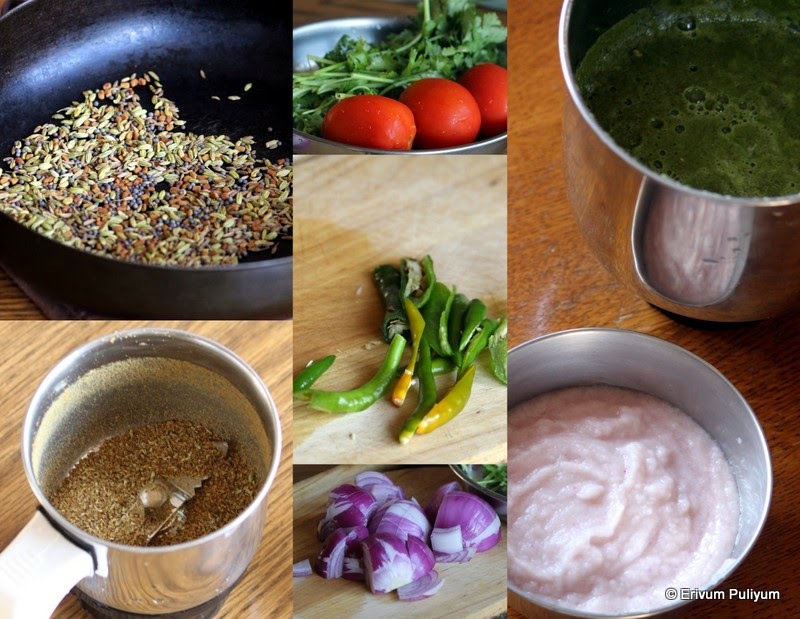 * Use green chillies as per tolerance as this is the only spice in this recipe. * I have not used onion seeds in the recipe as I didn't have it.If you have it,please use. * I have omitted dry amchur powder as I added yogurt and the yogurt was sour enough. Kids have been always a big fan of nutella and there had been no choice that replaced this.But lately,they started liking a newly introduced spread from stores,a chocolate -almond spread.This spread tasted almost like nutella and now kids have acquired this taste more than nutella.That's the time,I started thinking of preparing my own batch of homemade spread.I found this was the best way to sneak in almonds to kids.But do you think this is economical? No, dear friends..this is not a right recipe if you are looking to compare costs to the store brought ones.However,am happy with the trial and error recipe that is purely homemade with no much ingredients.And this tastes much better than the store version as this has purely almond butter to enhance the tastes.Do give this a try if you wish to sneak in almonds to kids,Kids will surely love it !!! Add the almonds in a blender and grind until smooth (I could get almost smooth but still had very fine grains too,I stopped when my mixer got very hot).Give a break,scraping the sides of the blender and keep running the blender/grinder a couple of times more till the almonds leave out oil and starts to come together.At this point when you can no longer blend it add the oil as required little by little.Blend again until you get a smooth finish.Almond butter is ready to use with your favorite recipes or proceed further to make chocolate almond spread. 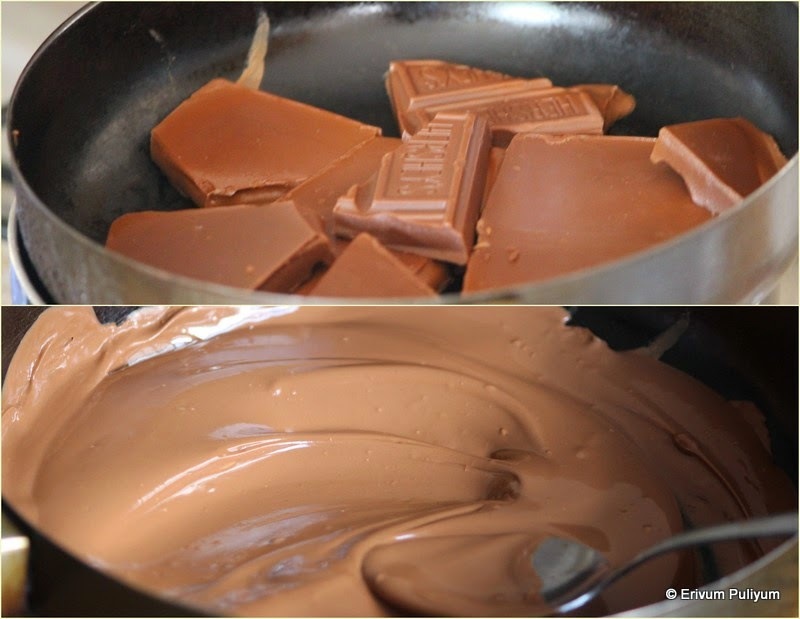 -Double boil and melt the chocolate by placing it in a bowl over boiled water.Keep stirring till all the chocolate is melted and is smooth. -Remove from heat and add the almond butter to this melted chocolate. -Stir it completely to incorporate well and to get a creamy smooth finish. -Ready to serve with breads.Cool down completely before storing in bottles. * I haven't added any additional sugar as there was enough sugar in chocolate. * Almonds should be processed in a blender free of any moisture or water content else the shelf life may not be certain.You can use blanched or whole almonds.I have used whole. 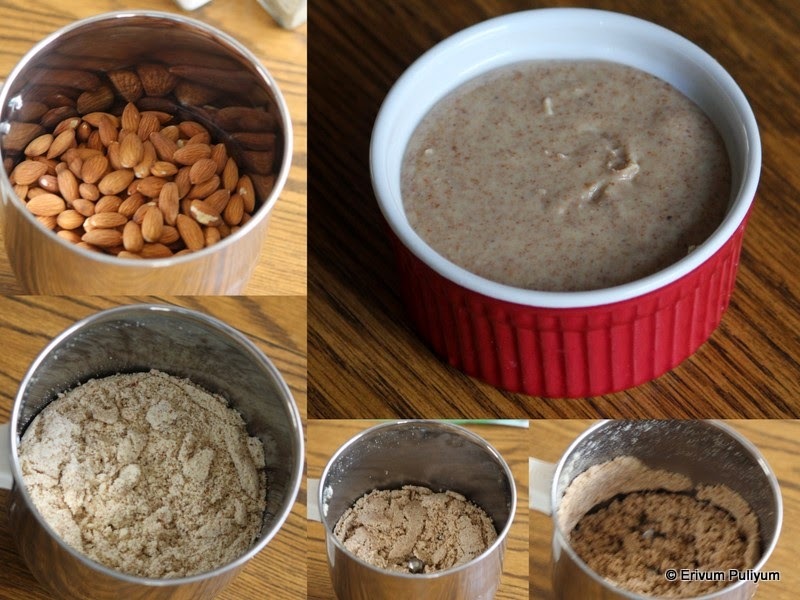 * I have used the whole almond butter prepared from the 2 cups almonds.It yields 1 cup plus of almond butter. * You can double the recipe and make large batches. * If you wish to make the consistency slightly thinner,then add more oil and make your desired consistency. Do you love sipping soup on a rainy day or cozy day ?? I love to do so,here the temperatures have dropped,its chill in the evenings and days are getting shorter.Looks like winter is early this year.Soups are the best way to keep you warm.Egg drop soup is found commonly in all Chinese restaurants.The egg drop soup can be turned in to a quick dinner by adding cooked chicken or other vegetables.I got hold of "The Chinese Take out Cook book" by Diana Kuan from the library and this book contains many simple to try recipes that I have bookmarked to try.This recipe is also from the same cookbook.This is a very healthy comfort soup,Enjoy !! Combine the chicken /vegetable stock,rice wine and grated ginger to a boil.Reduce the heat to simmer and add sugar,salt and pepper powder. In a nother bowl,lightly beat the egg with a fork.Pour it in a steady stream with continously stirring with a long spoon..The egg should cook immediately and strands appear,turn off heat immediately to prevent egg from getting over cooked.Ladle in individual soup bowls and top with chopped scallions and serve. 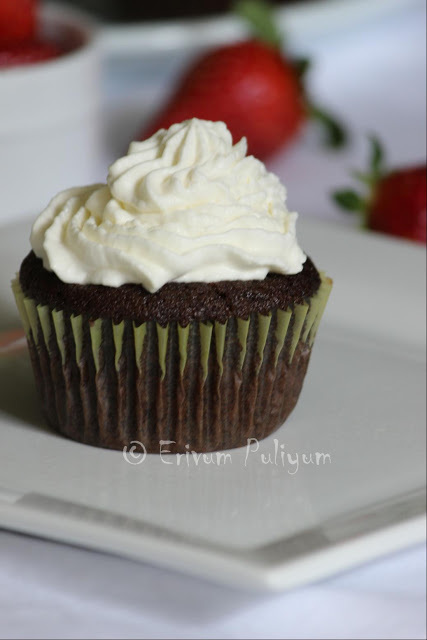 * You can use other flavorings like cinnamon/cloves/star anise or use all too. * You can add vegetables like mushrooms or tofu with this soup. This month Baking Partners Challenge was baking Simit.This is a turkish sesame seed circular ring bread.Simit is a famous street bread or the poor man's bread.They are dipped in molasses.Simit is generally served plain with tea for breakfast or with fruit preserves or with cheese.The recipe was suggested by Swathi @ Zesty South Indian Kitchen.My kids loved having with nutella.This has a crispy outer cover with soft bread inside.Do give it a try & enjoy !! -In a bowl add flour, yeast, salt and pinch of sugar and mix well.Then gradually add water to form smooth dough,knead well about 10 minutes until the dough is no longer sticky. -Cover the dough and leave it in a warm place for 1.5 hours or until doubled in bulk.Turn out the dough into a lightly floured surface and punch down.Knead for 2 min. -Divide it in 12 pieces(about 45 g each) and shape them in long rolls. -Take two rolls and form a twisted rope like this. -Then form this twisted rope in a circle by pressing and sealing the edges together. -Dissolve the molasses in 1/2 cup water and dip each circular ring in this. 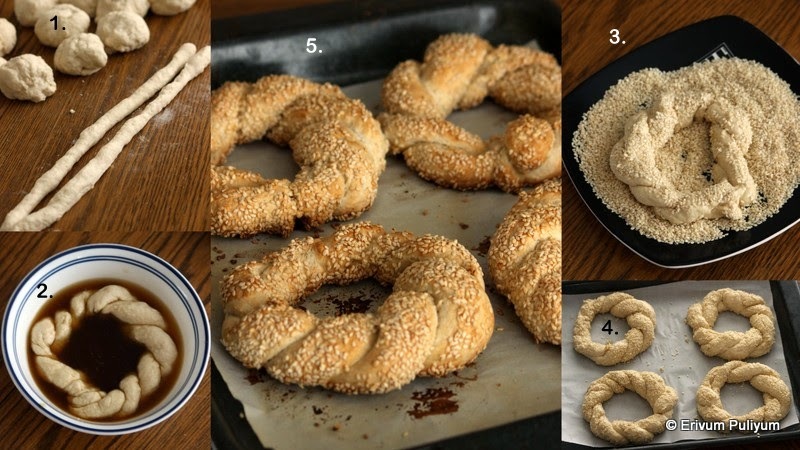 -Keep a plate ready with sesame seeds and roll each dipped simit in sesame seeds. -Set aside for 20 minutes for second rise on a tray with parchment paper.Simit needs to plumb up little. - Bake them in 450 F pre-heated oven for 20-25 min or until brown.Cool on wire rack and serve warm with tea !! 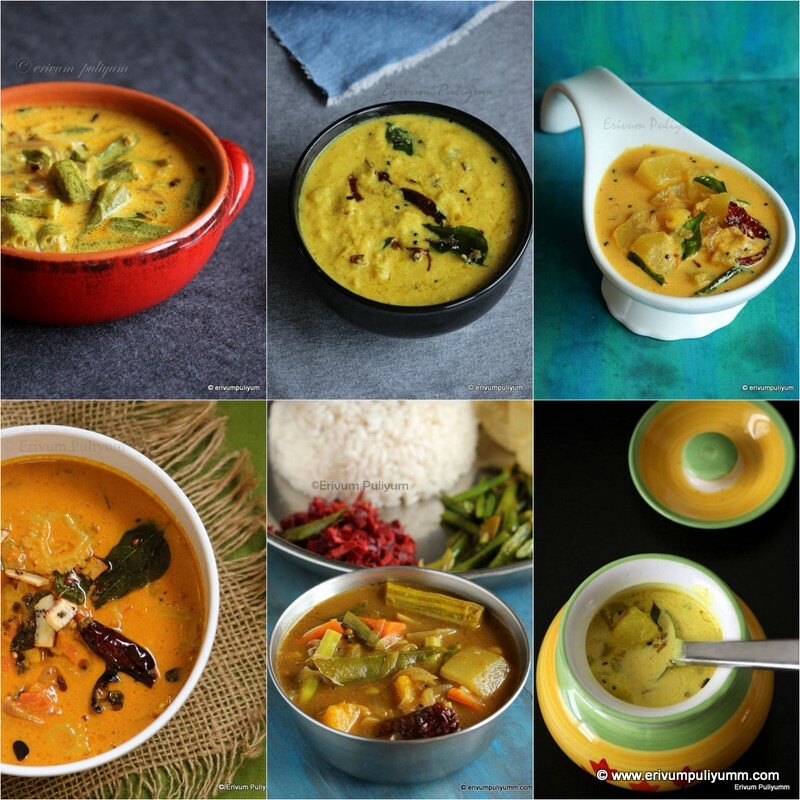 Nurukku Upperi | Kaya Upperi ~ Onam Special ! !